No event shares more talent, genius, or expertise with educators than Constructing Modern Knowledge! Don’t believe it? Check out this year’s guest speakers or the remarkable experts who have graced CMK over the past eight years. 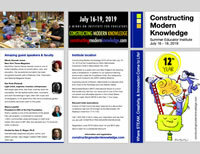 Constructing Modern Knowledge 2016 already features a TV star (Paulie DiMeo), the creator of Scratch (Mitchel Resnick), and perhaps the world’s most profound educator in the world (Carla Rinaldi). Constructing Modern Knowledge is heavily influenced by conversations with my mentor, Seymour Papert. For eight straight years, Papert’s longtime friend and colleague Dr. Marvin Minsky, “father of artificial intelligence,” led an annual fireside chat at CMK. During this very special aspect of the institute, one of the world’s wittiest, brilliant, and accomplished scientists contributed his time to chat with educators about anything they wished. Constructing Modern Knowledge is pleased to announce that Dr. Stephen Wolfram will be a guest speaker at CMK 2016. Dr. Wolfram is widely considered one of the world’s most accomplished scientists and mathematicians. Wolfram earned a Ph.D. in theoretical physics at 20, a MacArthur Genius Award at 22, and is the creator of Mathematica, Wolfram|Alpha, Wolfram Language, and the largest book ever published – A New Kind of Science. Wolfram is not only one of the planet’s smartest people, he just so happens to have created the most powerful computational tools used by mathematicians, scientists, engineers, and your iPhone. No one exemplifies the canyon between mathematics and school “math” better than Wolfram. Like so many great intellectuals, Stephen Wolfram counted Marvin Minsky as a mentor, friend, and inspiration. Dr. Wolfram’s participation in CMK is just one way in which we honor our friend Marvin. Whether you are registered for CMK 2016 or not, you owe it to yourself to learn more about the extraordinary life and work of Stephen Wolfram. Here are a few places to start.